Lightning McQueen went to NASCAR's victory lane last week when Kyle Larson drove the "Cars 3" vehicle to a win. The McQueen paint scheme has shifted to Clint Bowyer's car this week, and he's looking to keep the winning streak going. "Hopefully, lightning strikes again." Bowyer said. "The kid (Larson) won in the Lightning McQueen scheme last week and it would be cool to take Lightning McQueen to victory lane again this week." His odds could be decent. Bowyer won at Sonoma in 2012 and is piloting the car that Tony Stewart drove to victory — the last of Stewart's NASCAR career — last year. So Bowyer smartly removed any additional pressure by not telling 2-year-old son Cash about the special "Cars 3" paint scheme. He estimates he's watched the franchise with Cash "no less than 300 times," and his son would have been extremely thrilled by the car. But Cash wasn't invited to this race weekend in picturesque wine country, so Bowyer didn't mention Lightning McQueen. "It is almost impossible to bring the kids on the road out here. The wives go out and have some fun," Bowyer said. "That is why we didn't tell him. Hopefully, he will be able to see it on the news come Sunday afternoon back home." That would be a breakthrough for Bowyer, who is in his first season driving for Stewart-Haas Racing and has yet to win as Stewart's replacement. In fact, Bowyer hasn't won at all since the 2012 season. The move to SHR has been helpful in getting him closer to the front, and Bowyer is currently 12th in the Cup standings. He has a pair of top-five finishes, which already have him on pace for his best season since 2015. 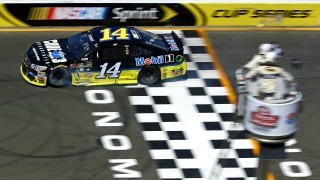 Now he could in theory make a push to end his losing streak with a victory at Sonoma. Bowyer has developed into a decent road racer — his average finish is 11th and he has eight career top-10s at Sonoma — and the success sometimes boggles his mind. "I have no idea how this became one of my best tracks," he said. "The win (in 2012) was a shocker. I always have fun here. Attitude is everything and you don't want to believe that until you see it, but this has always been a fun weekend for me. The area, the event of this race track is awesome. The fan base. Everything about this place." Of course, Bowyer will have a ton of competition on the race track, including from Larson, the current Cup points leader. Larson's victory at Michigan last week was his second of the Cup season, but marked a roll in which Larson won four races in eight days that included his sprint car schedule. It's given him the momentum headed into his home track. Larson is from nearby Elk Grove and attended this race as a child — and avid Jeff Gordon fan — before launching his career. "Being the point leader coming home to California is a cool thing," he said. "To get it back before we come home is cool. And then we have been running good a lot of us young guys have been running good this year, so it's a great time for us all to kind of step up and show the sport and the fans that we can take it over." Larson then praised the current young crop of talent that includes Chase Elliot, Ryan Blaney, Daniel Suarez, Erik Jones, Austin Dillon and Ricky Stenhouse Jr.
"We are all under 30. (Joey) Logano is still really young," he said. "It is a great opportunity for all of us."